The Gujarat strongman waiting to prove his mettle to the nation once again flexed his rightist muscle in the far eastern corner of the country, warning China of its expansionist plans, and assuring the northeastern people the rising sun and a blooming lotus. BJP prime ministerial candidate Narendra Modi on Saturday countered China’s frequent claims over Arunachal Pradesh, saying no force in the world could take the state from India. “It is because of the brave martyrs of the state that the eastern frontier of the country is safe. Times are changing now and China must change its attitude towards Arunachal Pradesh. I am here to assure you that no force in the world can take Arunachal Pradesh from India,” Modi said at a massive public rally in the state’s Pasighat town. “In the east, Arunachal Pradesh receives the first Sun rays in the country while in the west, Gujarat receives the last rays of the Sun. The Sun, while going down, promises Gujarat every evening that it would come again in Arunachal Pradesh the next day,” said Modi, adding that Arunachal Pradesh is the state that wakes up the country every day. At the Pasighat ghat rally, as also at Silchar in Assam, Modi took up the burning issues of the two states and appealed to the people to give him 60 months time (a five-year Lok Sabha term) to resolve the problems and bring development to the region. Modi also expressed his grief over the recent killing of Arunachal Pradesh student Nido Taniam in New Delhi and suggested there be hostels for students and job seekers from the northeast in plces like New Delhi, Bangalore and Chennai and other places. Pointing to the hydro-power potential of Arunachal Pardesh, Modi said that small projects could be built as the people were opposing big dams that were required for large power projects. “Arunachal Pradesh can light up the entire country. However, the people are opposing big dams but there is no harm building small projects to tap the potential of the state,” he said. At the Silchar rally, the BJP leader assured that if his party comes to power in the general elections, it would resolve the burning issues like illegal infiltration from Bangladesh, Hindu refugees and ‘D’ (disenfranchised/doubtfull) voters within 60 months. “Assam is near Bangladesh and Gujarat is near Pakistan. While the government in Assam has forced the people to suffer due to Bangladeshi infiltration, Pakistan is creating problems for me in Gujarat. 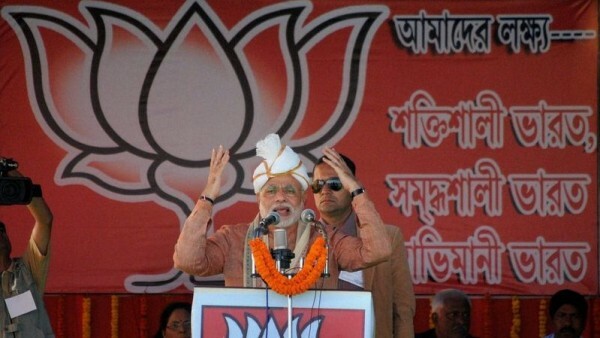 Now you have to decide whether you want to continue suffering due to Bangladesh or not,” Modi said. “Friends, I have come here for you. Trust me for once and if I come to power, I’ll end the system of detention camps in Assam. The government here is violating the human rights of some people for vote banks politics,” he said, adding that D voters should get back their rights. “Two categories of people have come to Assam from Bangladesh. One is those who escaped due to torture by fundamentalists. The other category is who came as part of a political conspiracy. However, when there is torture of Hindus across the world, the Hindus have only one country to come to,” he said, suggesting that such refugees should be equally settled across the country instead of Assam alone bearing the burden. “Those, who came to Assam as part of a political conspiracy must go back,” he said. On the problems of Assam’s tea labourers, Modi said they deserved a lot as they have been working in the plantations for over 150 years and gave an identity to the state in the form of tea. “We are going to set up a special board to solve the problems of the tea labourers if we come to power in the next elections,” he said. Modi also slammed Assam Chief Minister Tarun Gogoi, saying that when the state was reeling under severe floods in 2012, he was in the US and Japan. ”When he was asked about this, he (Gogoi) said he had gone to the US to study floodwater management. You have trusted the Congress for 60 years. So where is the harm in listening to me only once. Give me just 60 months,” Modi repeatedly said. Modi also compared the eight states of the northeastern to Asta Lakshmi (eight avatar of goddess Lakshmi), saying the lotus (the BJP symbol) must bloom in the region as it was the goddess’ seat.